The easiest way to change a fraction to a decimal is to use a calculator. You simply divide the numerator by the denominator. If you don't have a calculator, it's a little trickier. One way is to try and rewrite the fraction with a power of 10 as the denominator. 4/5 is the same as 8/10. We can write 8/10 by putting an 8 in the tenths place. Some fractions are harder than others to change to a decimal without a calculator. 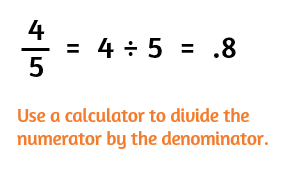 You could also use long division if you can't figure out a way to get a power of 10 as the denominator. There's more than one way to change a fraction to a percent. You could try to rewrite the fraction with 100 as the denominator, but this might be difficult if your denominator isn't a factor of 100. The fastest and easiest way is probably to use a calculator to change it to a decimal first and then move the decimal over 2 places to the right to change it to a percent.